That is where Brent Burke comes in. Brent takes the time to get to know you and your preferences. He can help you anticipate and prepare for the best and worst scenarios. The relationship Brent Burke establishes with you enables him to focus on your needs, what you want for your family and what you are currently doing. 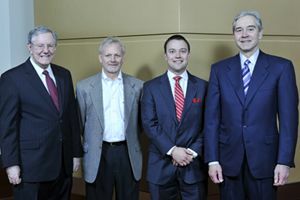 Northwestern Mutual sponsored a Private Breakfast in which Steve Forbes and Ed Zore spoke about the current state of our economy and strategy and opportunities they see moving forward. Steve Forbes stated that “sensible rules of the road and not over regulating” would be helpful in our financial recovery. Ed Zore said that the days of heavy leverage in investment deals are over. Both leaders spoke of their upbringings and also about the tremendous opportunities they saw moving forward. Brent Burke's mission as a Northwestern Mutual Financial Advisor is to help you identify and achieve financial security for your family or business. My clients are to have an experience marked by trust, honesty and integrity. Along with a Network of Specialists, Brent provides innovative solutions using world-class insurance services and internationally recognized investment products. Through this, he develops enduring relationships with his clients.